Only hours after a State Supreme Court justice told DraftKings and FanDuel that they couldn’t operate in New York while a case regarding their legality was pending, a state appeals judge said that the two fantasy-sports giants could stay in business — at least for now. Appellate judge Paul Feinman granted an emergency temporary stay to the two companies, which were somewhat terrified of what would happen to business if they lost New York, even temporarily. According to ESPN, more than half a million people play daily fantasy sports in New York — 13 percent of the nation’s fantasy players. This year, those who played paid more than $200 million in entrance fees. Both sites argue that the fact that only a few players win most of the money is a feature, not a bug, and it’s one that proves that daily fantasy sports is a game of skill. According to the Albany Times Union, if you tried to visit the FanDuel site in New York on Friday morning, you were greeted with a message that reads, “We’re sorry, but your location prohibits you from making deposits or playing on FanDuel. Customers from the following states are currently ineligible to participate on FanDuel: Arizona, Iowa, Louisiana, Montana, Nevada, New York or Washington.” In October, Nevada kicked DraftKings and FanDuel out of the state for breaking state gambling laws. 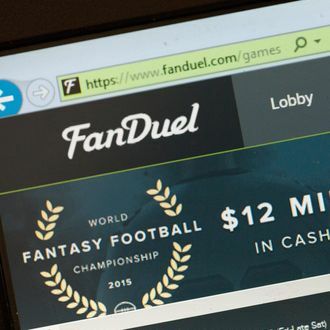 The FBI and Justice Department are also investigating the daily fantasy sites to see if they are breaking any laws.